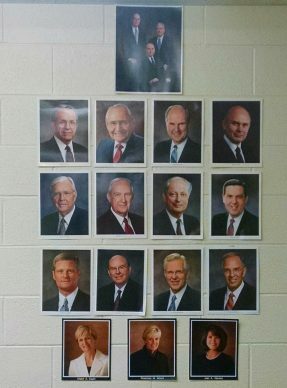 In our primary room the children see pictures of the Primary General Presidency underneath pictures of the 1st Presidency and Quorum of the Twelve. The Relief Society and Young Women classrooms also have pictures on the walls of their respective auxiliary presidencies. It’s nice to see a few female faces on the walls at church. The children in primary ask about the women’s faces they see and we’ve had discussions about the ladies that plan Primary for all of the children in the world. Our children see so many images in the world of objectified women. It’s a relief to have a few good examples of women leaders for the children to look up to at church.